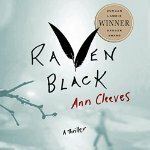 Selected by a reading group of mystery readers – I nominated it because it sounded like a traditional detective story set in an interesting place – Sheffield Islands. Raven Black is the first 0f 4 in a series and I think I like this one well enough to continue the series but … I’ll say that and then not get to book 2. A little of everything here except gunplay and chases. A girl is found murdered on New Year’s Day so an investigation begins, The obvious suspect is the mentally deficient man who lives alone and nearby – he was the “obvious” killer when another little girl went missing eight years prior. The town has never forgiven him for not even being tried for murder so they pretty well know who’s guilty this time. But Detective Jimmy Perez is assigned from another island and he comes in with his own ideas. Plenty of clues and a few suspects – the same woman finds both bodies, the girls’ names both begin with “C,” the last girl turns out to have been a bit strange, etc. But there are substantial differences too, like the age difference in the victims and the method of killing. There’s nothing terribly original in the book – the writing, plot, character development are all okay – even the setting, which held so much promise for me was a letdown. Still, I just kind of enjoyed it. Reminded me a bit of Louise Penny’s Inspector Gamache series.